This ist the newest invention by Steven Koliski. 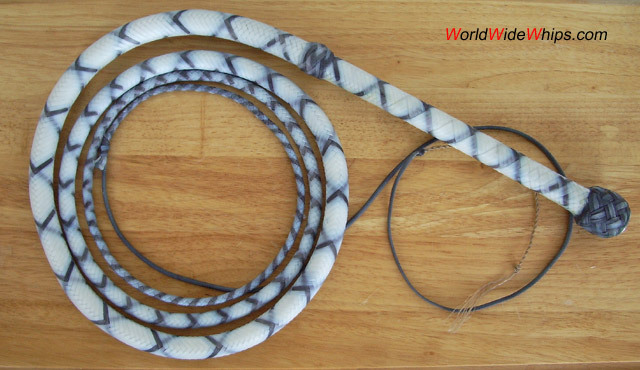 This 8 ft / 20-plait whip is made of Spectra, a high-tech fiber also used in space technology. It performs like a whip made of roohide, but is more sturdy. The plait changes several times over the length of the whip. The hand part has a square pattern, followed by a four-seam herringbone. 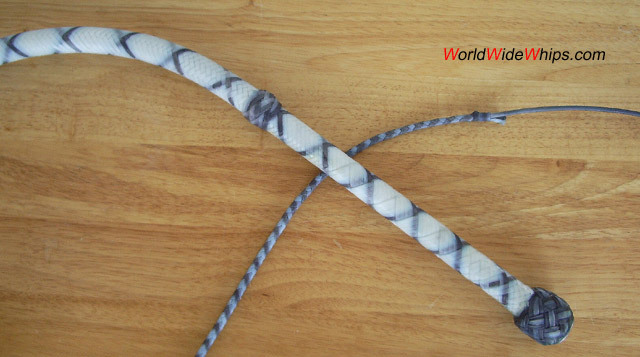 On the transition, the most-stressed part of the whip, the herringbone pattern changes to eight-seam, then to four-seam agan. The fall is attached with a fall knot like on leather whips. The fall itself consists of three different lengths of hollow material, the inner ones made of Dacron, the outer one made of Nylon, sled into each other to create a taper like on a leather one.